There’s nothing more that I’ve been waiting to happen, it’s finally October. That means I’m 18 in 2 days, where has time gone? I just remember turning 13! Wow. As the autumnal colours come back in to trend and dark nights occur September has ended. I’ll show you what’s been my first pick up of the day or in my top draw throughout September! Experimenter Bath Bomb – Lush.The colour of this bath bomb is intriguing in itself, never mind the scent which as well is incredible. It just gives me the unicorn and rainbow vibes in the bath I mean ah what’s not to love! 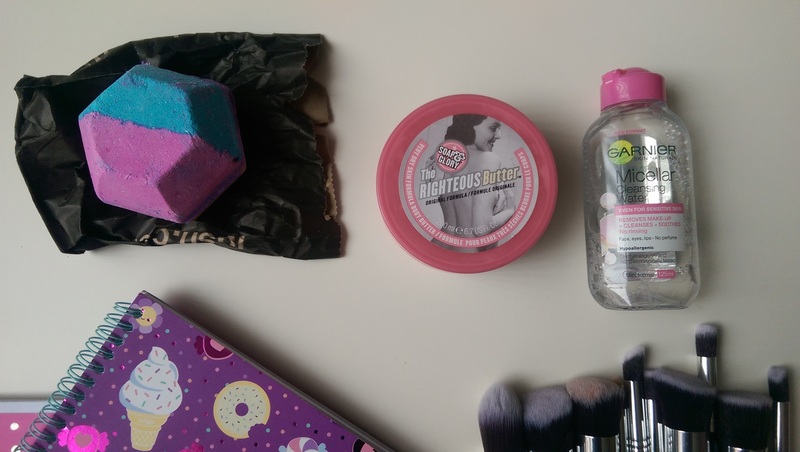 Soap & Glory Righteous Butter – Boots. I kind of forgot about this, then after good old clean I re-discovered how much I loved this on my skin I mean it absorbs so well and leaves my skin smooth and hydrated with other body butters I just feel it doesn’t absorb but this is the one. Pink Polka Dot Notebook – Smiggle. As I’ve been back at college I’ve been loving my bright pink notebook and I do love polka dots so I mean you can’t go wrong. Icecream & Doughnut Notebook – Journal. This one is much more I mean is a reflection of me – comfort food. Ahh it’s good to dream whilst your in college this helps out. Garnier Micellar Water – Superdrug. Recently, eye make up has made an appearance on my face quite frequently and this bad boy micellar water does a perfect job by gliding this off so smoothly without any pressure. It’s like heaven when taking off your make-up. Premium 10 Piece Kabuki Synthetic Make Up Brush Set – Savisto. Since I received these in the post I haven’t even used my beauty blender I just loving having the freedom to use different brushes for the different ares on your face. What have you been loving this September? Comment below.